San Francisco: Honda is universally recognized as a maker of well designed, finely crafted, reliable, economical vehicles. Hundreds of thousands of Accords spill out of factories in the Midwest every year for American consumption. But what about the Honda that’s built just for fun? That’s the S2000, a true two-place sports car. Honda introduced the S2000, appropriately enough, for the 2000 model year, back when the number 2000 sounded futuristic. The car in showrooms today is much like that original car - at least on the surface. Today, it puts out 237 naturally aspirated horsepower at a high 7,800 rpm from a modest 2.2-liter four-cylinder engine, but that adds up to a lot. That little engine will shoot you down your favorite roads like an angry hornet. A manual six-speed lets you pick your gears with a quick wrist flick. Honda lists the EPA mileage for the 2.2-liter at 20 City, 26 Highway. That’s great for a sports car. The EPA’s Green Car list pegs the S2000 at a 6 for the Air Pollution Score in life. Many Americans’ awareness of little sports cars started with the MGs, Triumphs, and Austin Healeys of the 1950s and 1960s, and this car has all the good old fashioned charms, from a quick drop top to instant turning behavior, mixed in with the joys of al fresco motoring in a cozy space. Of course, today’s car uses VTEC high technology and fuel injectors instead of fussy, dirty carburetors, so you get low emissions and higher performance at the same time. Trusty four-wheel disc brakes with antilock, ventilated up front for faster cooling, perform stopping chores in a way only dreamed of in the mid century cars. Instead of annoying, clunky side curtains or a complicated top assembly, with the S2000 you just unlatch and drop the cloth top in less than 10 seconds. It goes back up just as fast. Naturally, there are plenty of airbags for safety, side impact door beams, and the computer wonders of Vehicle Stability Assist to keep the car behaving it self as you go crazy with it on the curves. Despite being new, compared to the old British rides, the S2000 has a few old qualities of its own. In an era of folding hard tops, it definitely sticks with cloth. That means you can actually use your trunk, but you do hear more of the outdoors than you might experience in a coupe. Also the S2000 uses a digital dashboard, which is about as contemporary as giant glasses and bellbottom pants on men. But it does work well, as you might expect, with its chunky mph number and a graphic tachometer instead of a gauge. A starter button lives to the left of the steering wheel, and the audio system hides out of sight behind a metallic door. But you can adjust it from a panel to the left side of the steering wheel. Honda gives you two storage nooks in the center console behind you, but not much other storage inside. It’s definitely cozy. The center armrest is hard plastic, but felt to me surprisingly comfortable. 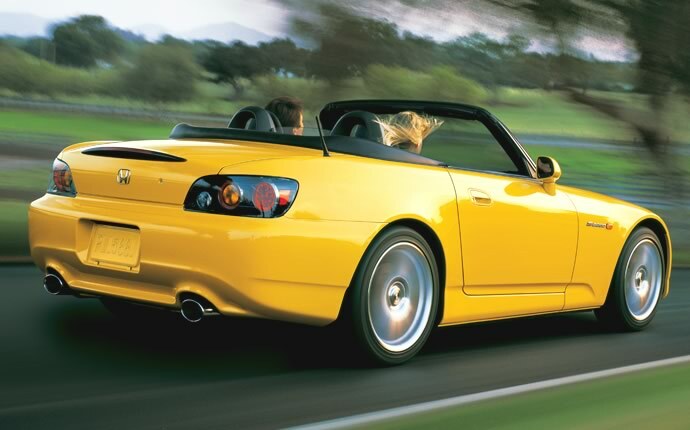 Compared to most little convertibles, the S2000 feels firm, direct, and track ready. The metallic shift knob adds a tactile sense of the business like drive train. Front and rear stabilizer bars keep the ship level during spirited changes of direction and quick braking or acceleration. My Laguna Blue tester was so much fun that I put the top down, even when it was cold outside, and turned up the heater. Reliability? Of course, and no tune-ups for 100,000 miles either.